I am not really one for eating my greens. Although we do take our health somewhat seriously around here, and we try to get in a decent amount of exercise and fresh air and balanced meals on a quasi-regular basis, the only way I can convince myself to ingest the kind of walloping doses of greens that I feel my body needs is to choke them back in the form of a daily smoothie. Usually with a red wine chaser. It’s not pretty, but that’s what I do. My husband, although he will gladly pick up mountains of kale on his way home from work and sometimes even makes my smoothies for me, is not a fan – it’s probably even safe to day he is slightly disgusted by – my pureed sludge. He, bless him, used to be a vegetarian, so he has a much better handle on what a healthy lifestyle entails than I, who, if it weren’t for the fact that I am nearing forty and vain, could happily subsist on wine and rare steak and anything involving duck fat. He actually likes to eat greens, tossing with abandon handfuls of baby spinach into stirfries and pastas and other dishes that cause me to wilt slightly at the very sight of them. And, although he is back on eating meat (I don’t like to think I had anything to do with that, although I am sure the tofu fried in duck fat – “this is the best stir fry I have ever had!” – may have played a part), he’s got a great enthusiasm for things like pulses and beans. Those Moosewood cookbooks on our kitchen shelves all came into our relationship with him. So the other day, when I came home from the playground to find him cooking lunch, I may have reacted a little less than graciously – especially when he announced that he was making quinoa and kale. 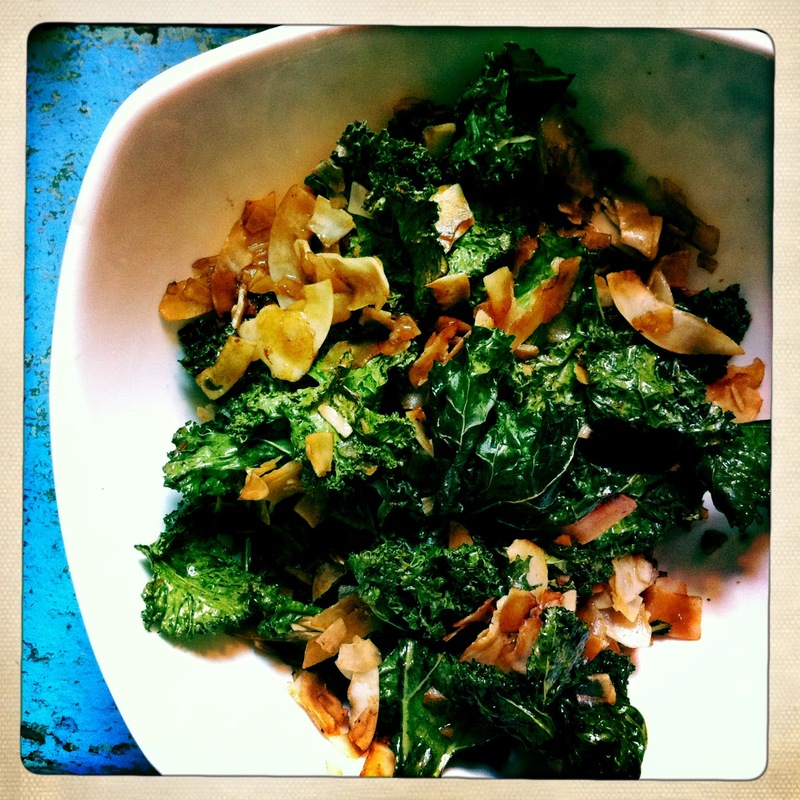 Even when he told me that the recipe came from one of my cookbooks, I was unconvinced – what could possibly be done to kale to make a dish that was even palatable, much less delicious and satisfying? Well, as it turns out, this. I have now made this warm kale salad at least a half a dozen times, and I like it equally well every time. And when I can cajole my husband into making it for me, I like it better still. The ingredients here are all the same as in Heidi’s book, but I have fiddled with the quantities somewhat. Also, I wouldn’t eat it with quinoa again, but it’s wonderful with socca. Preheat oven to 350 degrees, with two racks in the upper third. Combine kale and coconut in a large mixing bowl. Whisk together remaining ingredients in a small bowl to make a dressing. Pour about 2/3 of dressing onto kale mixture and toss well to combine. Divide evenly between the two prepared baking sheets and cook 12-15 minutes, switching the pans on their racks and giving the kale a stir about halfway through. Coconut should be golden and kale slightly crisp. Remove pans from oven and let stand about 5 minutes. Drizzle with remaining dressing and serve. I did laugh out loud at your reaction to the quinoa and kale!